Refer clients and earn money. Register NOW for 25% from EVERY job. Easy way to make money. Refer clients and get a cut from EVERY job they order. The more users you refer the more money you make. You get full insights over who did you refer and what job they ordered. 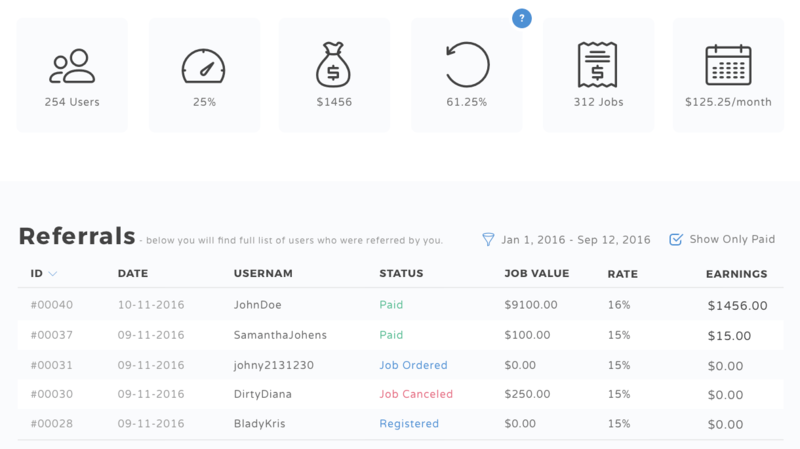 Inside the dashboard you will find usefull statistics like: number of referred users, referral rate, total income, conversion rate and many more. You can see each referred user and jobs they have ordered. This way it's easy to track your referrals. We are recommended by many WordPress specialists. See the list below. Below you will find promotional banners and press package. Browse the FAQ for answers. If you couldn't find the answer to your question please browse the global FAQ or contact us directly. We track our referrals through cookies. If a user enters the site for the first time via your referral link a cookie is set and this user is "bound" to you. If he registers and completes at least one job within first three months from the first encounter with WPKraken.io the customer is assigned to you and you get the referral cut. Learn more. Where can I find the statement for my referrals? Please go to Affiliate tab in your dashboard. There you will find a table with all the inforation about: registered users, ordered jobs, payments etc. We put a lot of effort to make this as transparent as we can without exposing the privacy of our clients.